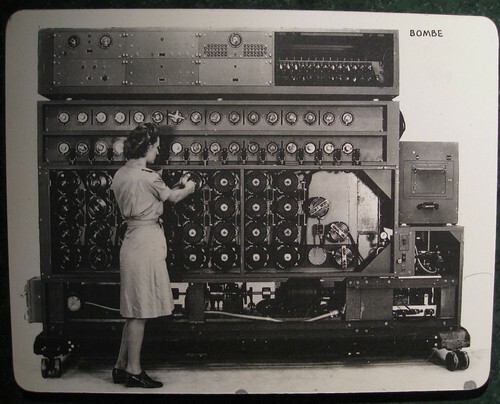 Women were some of the earliest programmers – here with a decryption system for the US Army. CC-licensed photo by brewbooks on Flickr. A selection of 12 links for you. Happy Valentine’s day, keep on with the love. I’m @charlesarthur on Twitter. Observations and links welcome. [Mary Allen] Wilkes remembered her junior high school teacher’s suggestion [from her geography teacher, who in 1950 said she should be a computer programmer]. In college, she heard that computers were supposed to be the key to the future. She knew that the Massachusetts Institute of Technology had a few of them. So on the day of her graduation, she had her parents drive her over to M.I.T. and marched into the school’s employment office. “Do you have any jobs for computer programmers?” she asked. They did, and they hired her. It might seem strange now that they were happy to take on a random applicant with absolutely no experience in computer programming. But in those days, almost nobody had any experience writing code. The discipline did not yet really exist; there were vanishingly few college courses in it, and no majors. (Stanford, for example, didn’t create a computer-science department until 1965.) So instead, institutions that needed programmers just used aptitude tests to evaluate applicants’ ability to think logically. Wilkes happened to have some intellectual preparation: As a philosophy major, she had studied symbolic logic, which can involve creating arguments and inferences by stringing together and/or statements in a way that resembles coding. Wilkes quickly became a programming whiz. She first worked on the IBM 704, which required her to write in an abstruse “assembly language.” (A typical command might be something like “LXA A, K,” telling the computer to take the number in Location A of its memory and load it into to the “Index Register” K.) Even getting the program into the IBM 704 was a laborious affair. There were no keyboards or screens; Wilkes had to write a program on paper and give it to a typist, who translated each command into holes on a punch card. She would carry boxes of commands to an “operator,” who then fed a stack of such cards into a reader. The computer executed the program and produced results, typed out on a printer. To me, the remarkable person in this is the geography teacher in 1950. Why did they think of a woman being a computer programmer – a discipline that didn’t exist? The word “computer” mean “person who computes” at that time. Think about it too long, and you could start thinking it’s a meddling time traveller. The company’s premium news service will be integrated into the Apple News app, letting consumers subscribe to a bundle of titles for a monthly fee. Some publishing executives are wary of taking part, Bloomberg News reported in December. The magazine subscription service, which has been in testing with Apple employees for months, will launch as part of an iOS 12.2 update scheduled for release this spring. The updated Apple News app will include a Magazines tab similar to the app Texture, which Apple acquired last year. …This week, Sen. Ron Wyden, D-Ore., sent a letter to both companies asking them to remove the app. “Saudi men can also reportedly use Absher to receive real-time text message alerts every time these women enter or leave the country or to prevent these women from leaving the country,” he wrote. Ironically, Absher has also been helpful to a few women trying to escape the repressive Saudi regime. [HRW senior researcher Rothna] Begum says some women have managed to secretly change the settings in the app on their male guardian’s phone so that it allows them to travel. Twitter CEO Jack Dorsey and Recode co-founder Kara Swisher agreed to conduct an interview Tuesday on Twitter, and it had all the makings of a great read: the CEO of one of the most influential and controversial tech platforms in the world taking questions from one of the industry’s most ferocious reporters. The only problem? No one could follow along. Despite the public interview and a dedicated hashtag (#karajack) for the event, it didn’t take long before the dozens of tweets between the two started to get confusing. They were listed out of order, other users started chiming in, and there was no way to properly follow the conversation thread. Swisher’s questions about Twitter’s complex abuse policies and Dorsey’s subsequent responses were floating around my timeline along with the regular tech news and opinions I always look at. If you wanted to find a permanent thread of the chat, you had to visit one of either Kara or Jack’s pages and continually refresh. It made for a difficult and confusing experience. “I am going to start a NEW thread to make it easy for people to follow (@waltmossberg just texted me that it is a “chaotic hellpit”),” Swisher tweeted, referencing Recode’s other co-founder, the now-retired Walt Mossberg. I think this is a misunderstanding. Twitter isn’t a real-time service in that way. This is trying to use a hammer as a saw. For a long time, being out at sea meant being out of sight and out of reach. And all kinds of shenanigans went on as a result – countries secretly selling oil and other goods to countries they’re not supposed to under international sanctions rules, for example, not to mention piracy and kidnapping. The problem is that captains can easily switch off the current way of tracking ships, called the Automatic Identification System (AIS), hiding their location. But now thousands of surveillance satellites have been launched into space, and artificial intelligence (AI) is being applied to the images they take. There’s no longer anywhere for such ships to hide. Samir Madani, co-founder of TankerTrackers.com, says his firm’s satellite imagery analysis has identified Iranian tankers moving in and out of port, despite US sanctions restricting much of the country’s oil exports. He’s watched North Korea – which is limited by international rules to 500,000 barrels of refined oil every year – taking delivery of fuel via ship-to-ship transfers on the open ocean. Turning off the AIS transponders that broadcast a ship’s position, course and speed, is no longer a guarantee of anonymity. His firm can even ascertain what cargo a ship is carrying – and how much – just by looking at its shadow on the water, says Mr Madani. Tankertrackers is pretty cheap if you were into analysis of oil supply lines – $299 per year. Wow. It looks like a sort of Wikipedia of design elements – potentially, a fabulous resource. [Huawei chairman] Eric Xu questioned the US’s motives on Wednesday, pointing to Washington’s extensive surveillance programmes. “Is [the US] truly thinking about cyber security and protecting the privacy of other countries’ citizens, or do they have other motives?” he said. “Some say that because these countries are using Huawei equipment, it makes it harder for US agencies to obtain these countries’ data,” he added. Mr Xu also revealed that Huawei would spend more than $2bn to restructure the code used in its telecoms services worldwide after a series of “confrontational” meetings with Britain’s cyber security agency over the issue. The company is likely to face further criticism from the Huawei Cyber Security Evaluation Centre, the UK watchdog that reviews the company’s security systems, which last year noted the “repeated discovery of critical shortfalls” in the group’s technical processes. Last week, Huawei told the UK government it would take up to five years to address the concerns. Champion debater Harish Natarajan triumphed in a live showdown against IBM’s Miss Debater AI at the company’s Think Conference in San Francisco on Monday. The 2012 European Debate winner and IBM’s black monolith exchanged quick retorts on pre-school subsidies for 25 minutes before the crowd hailed Natarajan the victor. Each side was given 15 minutes to prep for the clash, after which they presented a four-minute opening statement, a four-minute rebuttal, and a two-minute summary. The 700-strong audience, meanwhile, was comprised of top debaters from Bay Area schools and more than a hundred journalists. Miss Debater (formerly known as Project Debater) pulled arguments from its database of 10 billion sentences taken from newspapers and academic journals. A female voice emanating from the human-sized black box spouted its answers, while three blue balls floated around its display. The face-off was the latest event in IBM’s “grand challenge” series pitting humans against its intelligent machines. In 1996, its computer system beat chess grandmaster Garry Kasparov, though the Russian later accused the IBM team of cheating, something that the company denies to this day – he later retracted some of his allegations. Then, in 2011, its Watson supercomputer trounced two record-winning Jeopardy! contestants. In the lead-up to Monday’s bout, Natarajan suggested that debating may prove a harder battleground for AI than Go and video games. “Debating is…more complicated for a machine than any of those…” he wrote in a LinkedIn post. Well I’d hope that debating was tougher than just stringing sentences together. Though I doubt Natarajan has any real idea of how hard Go or Dota 2 are for a machine or a human at the very top level. But, as it explains, you can do better design for those awful enterprise apps. India remained one of the bright spots in an otherwise declining global smartphone market in 2018. Smartphone shipments in the country were up by more than 12m at 137m, the best growth of any market in absolute volume terms. India now accounts more than 10% of the world’s smartphone market, up from 6% five years ago. It is one of six markets in the top 20 that posted positive full-year growth, with its performance outshone by Indonesia (17.1%), Russia (14.1%) and Italy (10.0%). Of these four markets, India is the only one that has seen consecutive growth for the past three years. 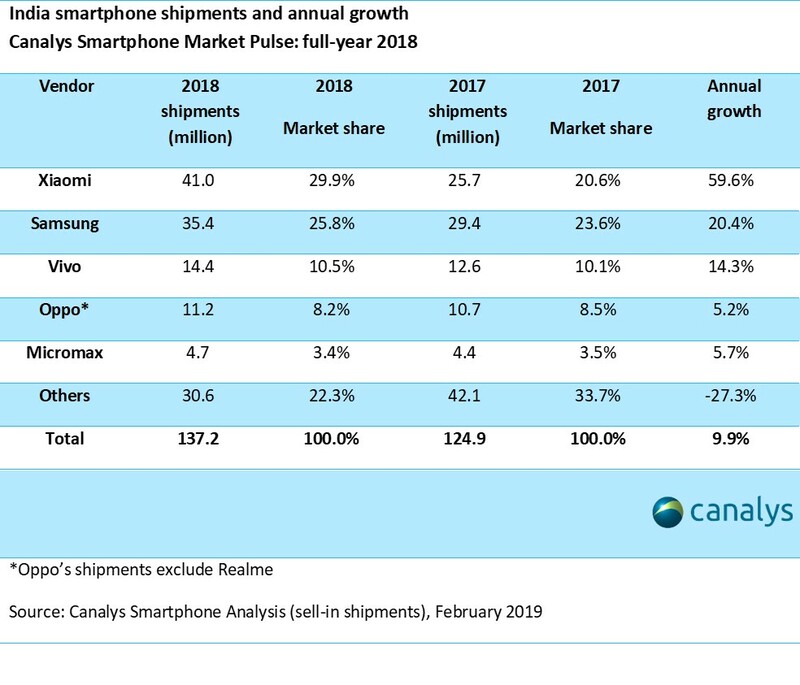 In terms of vendors, Xiaomi took pole position for the first time in 2018, shipping 41.0m units to take 30% of the total Indian smartphone market. Despite being knocked off first place, Samsung still grew shipments by 20% and took a 26% share of the market. Vivo, Oppo and Micromax held third, fourth and fifth place respectively. Notice the squeeze on “others” there. One other thing: Q4 is the biggest sales quarter of the year. Huawei is clearly eating Samsung’s breakfast, lunch and tea. While Apple is the clear market leader, the new Smartwatch Total Market Report reveals that the top three brands (Apple, Samsung, and Fitbit) made up 88% of smartwatch unit sales during the timeframe. However, traditional watch manufacturers, like Fossil, and fitness-focused brands, like Garmin, are working to grow their share of the market, as they continue to expand into the smartwatch category. Sixteen% of US adults now own a smartwatch, which is up from 12% in December of 2017, based on NPD’s Consumers and Wearables Report. The younger 18-34 age demographic is currently carrying the overall growth in the smartwatch market with 23% penetration. Android/Wear OS has, at best, 12% on that basis (Samsung has its own GearOS). The modular approach just doesn’t work for smartwatches at this stage of the platform – if it ever will. I’m still discovering stuff on my phone that can be clicked, swiped, or long-pressed. That means 80% of the people around me don’t stand a chance.